Before we get in some details, let’s consider some overall guidelines. I have noticed that some projects keep growing like weed, and I find myself bewildered in some jungle… The difficulties then arise not because data or models are difficult, but due to the sheer volume of the analysis. Although functions are a bit more difficult to debug, at the end of the day it is much easier. Normally or often the steps will be run many times (for different reasons), so it is much easier if all is under one roof. That said, pragmtic programming suggests to start easy, and to refactor frequently. So better start with a simple solution that works than to have a enormous code that chokes. Get the code running, then improve on it. 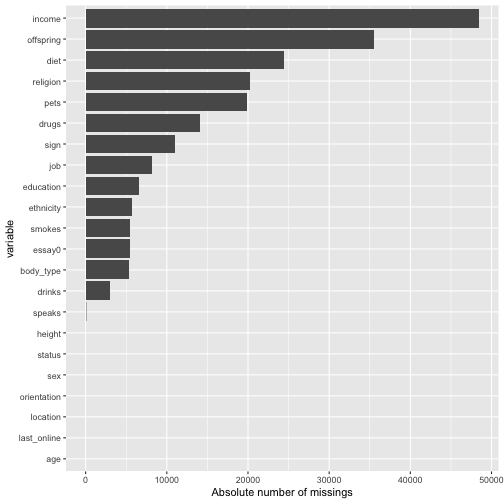 The OKCupid Data set (sanitized version, no names!) is quite nice. You can download it here. In the following, I will assume that these data are available. Let’s have a brief look at the data. With the code getting longer, it is easy to get confused about naming: data_v2_no_missings_collapsed is the right data matrix to proceed, wasn’t it? Or rather data_dat_edit_noNA_v3? Probably a helpful (though partial) solution is to prevent typing a lot. “Don’t repeat yourself” - if stuff is put inside a function, the objects will not clutter your environment, and you don’t have to deal with them all the time. Also, you will reduce code, and the number of objects if stuff is put inside functions and loops. Clearly, there are different ways to get to Rome; I present just one, which has proved helpful for me. The function kable prints a html table (package knitr). There seem to be quite a bit missings. Maybe better plot it. ## 4                                                                                                    i work in a library and go to school. . .
OK, that are length(cols_with_too_many_NA) columns. We would not want to exclude them because they are too many. Obviously, that’s a story for numeric variable only. So let’s have a look at them first. 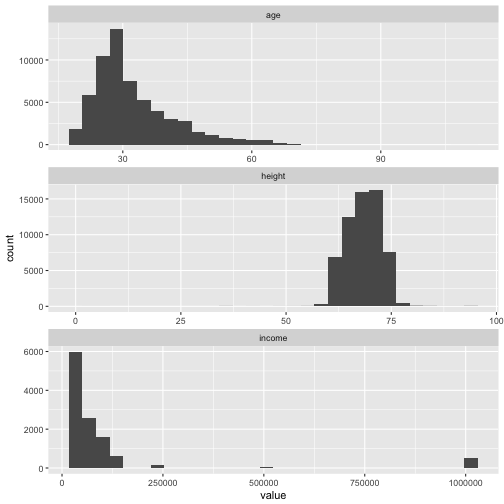 Histograms are a natural and easy way to spot them and to learn something about the distribution. ## `stat_bin()` using `bins = 30`. Pick better value with `binwidth`. ## Warning: Removed 48445 rows containing non-finite values (stat_bin). Especially income may be problematic. Find out more on gather eg., here. ## Warning: Removed 48445 rows containing non-finite values (stat_ydensity). 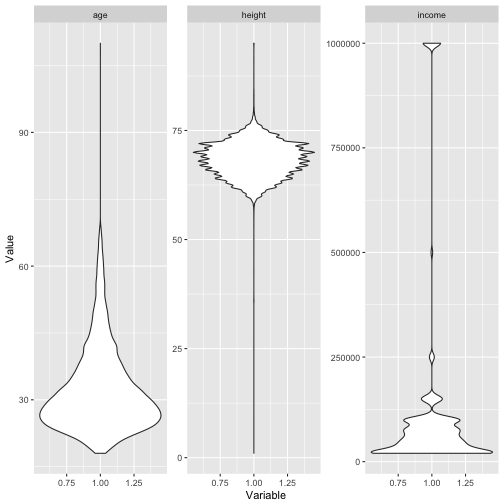 Similar to outliers, for categorical variable we can look whether some values are seldom, e.g, only 0.1% of the times. What “often” or “barely” is, depends on … you! Pooh, that takes ages to plot. And does not look too pretty. Maybe better don’t plot, since we are not after exploration, but just want to know if something is going wrong. This gives an indication whether some categories are quite frequent in relation to others. Plausibility check can includes checking orders of magnitude, looking for implausible values (negative body weight), among others. A good starter is to differentiate between numeric and non-numeric variables. The function map comes from package purrr; it maps each selected column to the function summary. For instance, the max. age of 110 appears somewhat high… And the min. height of 1 should rather be excluded before further operations start. For income similar reasoning applies. Let’s do not look at all these essay variables here, because “strange” values are not so straight forward to identify compared to more normal categorical variables (with less distinct values). We need to convert to factor because for character variables, no nice summary is available of the shelf. Applies to numeric variables obviously. A quite frequent use case is to get “strange” value or variables names in order, e.g., “variable 2” or “I rather not say” (including blanks or some other non-normal stuff). One approach is to use dplyr::recode. ##   "1"              "average"        "thin"           "athletic"
##   "fit"            NA               "skinny"         "curvy"
##   "full https://sebastiansauer.github.io/images/2017-02-13d"   "jacked"         "rather not say" "used up"
A second approach is to use base::levels for factors. ##   "a little extra" "athletic"       "average"        "curvy"
##   "fit"            "full https://sebastiansauer.github.io/images/2017-02-13d"   "jacked"         "overweight"
##   "rather not say" "skinny"         "thin"           "used up"
##   "1"  "2"  "3"  "4"  "5"  "6"  "7"  "8"  "9"  "10" "11" "12"
I do not use plyr:mapvalues because plyr can interfere with dplyr (and dplyr seems more helpful to me). base::scale performs a z-transformation of the matrix (like object) given as input.